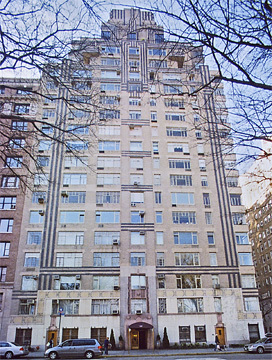 One of Manhattan's most important Art Deco residential buildings, the Ardsley was designed by Emery Roth, the architect who also designed such famous Central Park West landmarks as the San Remo, Beresford and El Dorado apartment towers. "This 22-story structure is dramatically different from every other Roth building that came before it, for there is no trace of historical styling in its rectilinear lines. The only precedent it recalls is the massing of a prehistoric Mayan temple. 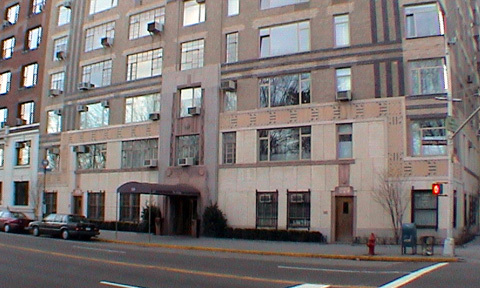 The Ardsley is Central Park West's most elaborately detailed Art Deco work. Contrasting with its buff brick wall surfaces are vertical bands of black brick that sweep up the facades, imparting an upward thrust to the composition. These are balanced by horizontal bands of black brick that relate the building to its streetscape. Further, the horizontal and vertical bands converge in the upper stories and in the tower to create bold geometric patterns. Above the fifteenth floor, multiple setbacks and cantilevered balconies culminate in the a stepped-back water tower, resulting in an animated yet balanced profile. Adding even more visual delight to this composition is a zigzag cast-stone frieze, consisting of geometric patterns in four-color inlay, applied to the base. The lower portion of the building is embellished further with pink-tinted cast-stone door surrounds, executed in voluptuously curving geometric forms." 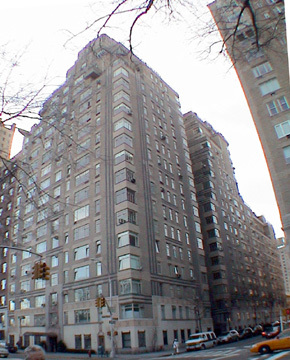 The building, which has 900 rooms and 206 apartments, contains mostly small apartments except for duplex and triplex penthouses that have terraces, 15-foot-high ceilings and circular staircases, as well as dens, libraries, dressing rooms and servants' quarters, but Mr. Ruttenbaum noted that "even though these were high-class amenities, they were not quite the same as in Roth's earlier buildings. The spaces were smaller, and the finishes were less elegant." It is interesting that a preliminary drawing for the Ardsley showed that Roth contemplated topping its watertank enclosure with a lantern-like finial, somewhat similar to those atop the towers of the El Dorado, one block to the south, on which Roth was the architect along with Margon & Holder. The built structure, however, does not need the finial tower as the boxiness of the composition is very effective and the tower would have distracted from its visual impact. The striped masonry patterning on this building is striking and very strong. The building's park frontage is almost symmetrical, but the strong accents of the patterning are quite remarkable and original. The building extends far into the sidestreet and has a lightcourt on the sidestreet which is highlighted by corner windows and more facade patterning. Elliot Willensky and Norval White remarked, in their book, "The A. I. A. Guide to New York City, Third Edition" (Harcourt Brace Jovanovich, 1988), that "there is a quality almost like that of inlaid furniture in the ribbons of contrasting brick which enrich the surfaces of the upper facades." 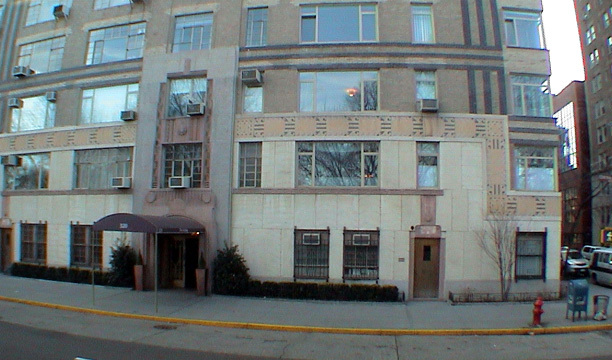 The building, now a cooperative, was completed in 1931 and Roth was one of its developers. It has no garage, no health club and no sundeck, but many corner windows, a canopied entrance with doorman, sidewalk landscaping and inconsistent fenestration.